It’s pronounced “Kalahadi” and the ‘h’ is very guttural. Right now we’re sitting outside our hut in Mata Mata camp, overrun with ground squirrels ‘cos everyone feeds them. 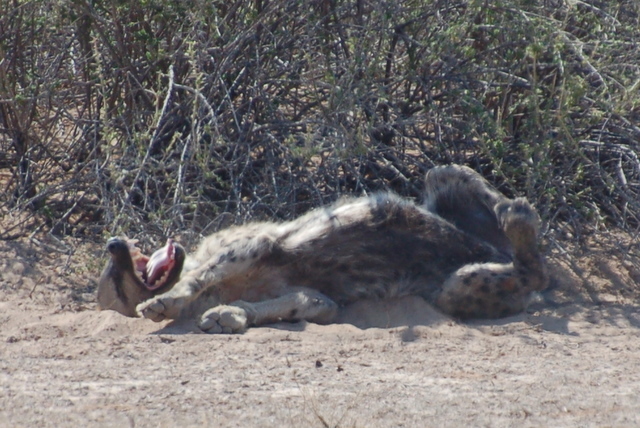 Apparently the spotted hyena who hangs around outside the fence is fed regularly too, which is why he hangs around. Tut. 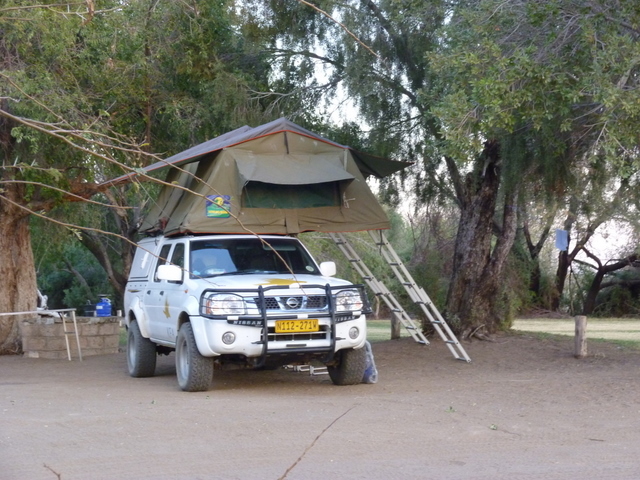 South Africans have a great way of going on a camping holiday. They stuff a great big 4×4 semi-trailer full of stuff and disappear into the wilderness. Every camp site and hut is equipped with a braai, so when they stop they can throw wood on the stove and cook whatever chunk of meat they can get ahold of. Nice. We’re having spaghetti with aubergine sauce and omelette served with chakalaka*, ‘cos our car isn’t equipped with a cooler box for meat and we’ve no room for bundles of firewood! Actually, as much as anything it’s because we had three hefty meat dinners our first three nights and wanted a break. …but it looks like I might be getting in the habit of doing one “travelling” post and then one “wildlife” post. Updates! We’ve left Kgalagadi now, so we get to take a break from odd self-catering meals (sardines on toast with butterbean curry!). 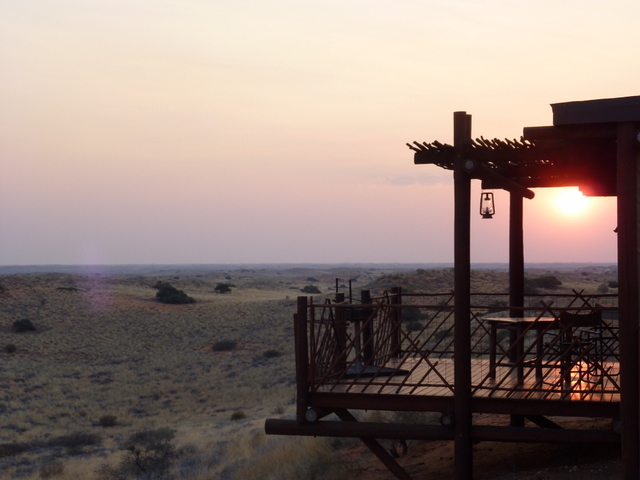 It was hard work viewing game in the Kalahari, there’s a lot of space and only a few animals; we probably drove 400+ kms on bumpy dirt roads. But the sense of isolation is memorable and some of the wildlife sightings were very cool. This entry was posted on Thursday, August 5th, 2010 at 8:09 pm	and is filed under South Africa. You can follow any responses to this entry through the RSS 2.0 feed. You can leave a response, or trackback from your own site.